New York—Sotheby’s New York sale of Important Judaica on 20 December will offer one of the finest decorated Hebrew Bibles from Spain to ever come to auction. Produced in Castile during the first half of the 14th century, this distinguished illuminated manuscript is a remarkable testament to the cross-cultural influences in the Golden Age of medieval Spain. Hailing from the renowned collection of J.E. Safra, the Bible will be offered this December with a pre-sale estimate of $3.5/5 million. As the earliest-known complete illuminated Hebrew Bible from Spain to ever appear at auction, the Bible is superlative in a number of ways. It is one of only six complete, decorated Hebrew Bibles in private hands. Of those examples, only three have come to auction in the past century. The tradition of illuminated Hebrew Bibles first began to flourish during the reign of Ferdinand III (1217-1252) and continued until the expulsions of the Jews from Spain in 1492 and from Portugal in 1496-1497. While the production of these Bibles can be ascribed to different artistic schools located in Castile, Navarre, Catalonia and Portugal, the present manuscript’s lavish decoration, both painted and micrographic (an embellishment whereby a specialized scribe fashions minute script into ornamental patterns) suggest that it was produced in Castile during the first half of the 14th-century. 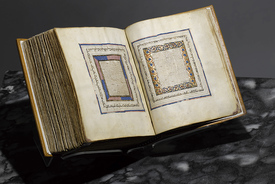 When the first embellished Hebrew Bibles began to appear in Castile during the early 13th-century, their patterns of decoration were based almost exclusively on an Islamic artistic repertoire, as seen in the present volume with its geometrically planned micrographic carpet pages at the end of the codex and micrographic frames with interlaced designs placed around significant biblical texts. Some of these patterns share commonalities in format and composition with illuminations in Qur’ans, as well as tooled patterns in book bindings that were produced in Spain by Muslim, Jewish, and Christian craftsmen into the 16th-century. It was only gradually-during the 14th-century- that the adornment of Hebrew Bibles in Spain began to reflect some of the motifs common in Gothic art, which was dominant in Iberian Christian culture of the 13th, 14th, and 15th centuries. The Bible’s decoration notably reflects these artistic interactions among the three coexisting religions, Christianity, Islam, and Judaism, a phenomenon referred to as convivencia.